Sub-Zero builds innovative food preservation systems. Our company specializes in all Sub-Zero appliance repair, maintenance, and installation. We repair all models of Sub-Zero from built-in and integrated refrigerators to undercounter and outdoor refrigerators technicians coolers. Our technicians are all factory trained and certified. They know everything there is to know about Sub-Zero brand as well as many other top brands of appliances. We work fast and do a quality job for our clients. We carry Sub-Zero genuine parts at below market prices. If you want your Sub-Zero appliance to be fixed by top industry professionals, we are the company for you. 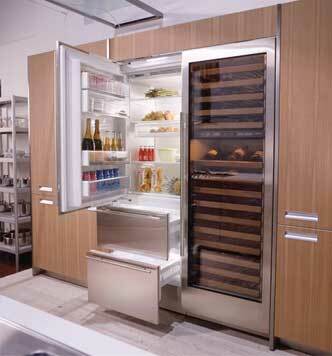 Sub-Zero is one of the most innovative appliance manufacturers around. 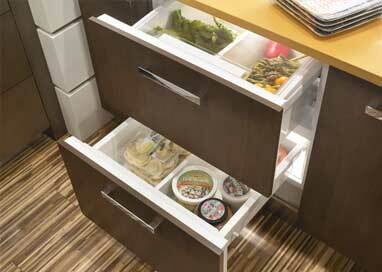 They are always pushing the envelope when it comes to both looks and functionality of their refrigerators. For example, they pioneered the concept of built-in refrigeration. Also, they offer PRO 48 which is a must for any professional kitchen. PRO 48 has dual refrigeration that keeps one side humid for fresh food and another side dry for frozen food. It had triple evaporators that allow the temperature in all the three compartments to be adjusted entirely independently from each other. With all this complex technology you need a certified professional to take care of any problems that you might have with your Sub-Zero. We are such professionals. Our 30 years plus experience in the field and our yearly certifications gives us experience and skills necessary to repair any Sub-Zero appliance. Besides outstanding skills when it comes to Sub-Zero appliance repair, we offer you excellent customer service. Our technicians are not only highly skilled, but they are also friendly, respectful and willing to help you. They are always on your side, trying to find the best solution for you. They come alway son time and fully prepared for every job, and they work fast. Our company also offers you flexible scheduling, accurate estimate and FREE service call with every repair job. Our prices are fair and reasonable, and we always give them to you upfront. We try to make your whole appliance repair appointment as convenient for you as possible. But the main thing is that you will love the results. Your Sub-Zero appliance will be as good as new after a service call from us. We have been doing Sub-Zero appliance repair for many years. In fact, our company Top Home Appliance Repair has been open for more than 30 years. We are family owned and family run company. We serve Los Angeles, Ventura County, Marin County and East Bay. Our company works on all the major home appliances such as refrigerators, dishwashers, washers, dryers, stoves and ranges, ovens, steam ovens, microwaves, freezers, ice makers, BBQs, pizza ovens, patio heaters and much more. Our company does both residential appliance repair and commercial appliance repair. What can you expect from a typical Sub-Zero appliance repair appointment with us? Firs you give us a call or fill out our short contact form. We will schedule a convenient appointment for you and give you our FREE repair estimate. Our technician will usually preorder all the parts necessary for your Sub-Zero appliance and pack all the tools necessary fro the job. He will get to your place right on time. He will quickly determine what the problem is with your appliance and will get to fixing it right away. Our technicians work fast, and they are very detail oriented. You can be sure that the job will be done right the first time around. After the job is complete, our technician will test your appliance and make sure that it works properly and is safe to use. Safety is very important when dealing with gas and electricity. Then our tech will clean after himself and dispose of all the broken parts. He will present to your perfectly functional and safe Sub-Zero appliance. He will also offer you some advice on how to keep your Sub-Zero in perfect shape for a long time. We also offer you our annual or bi-annual maintenance program. It covers all appliances in your kitchen and laundry. As a part of this program, our technicians will do all the maintenance for you on a regular basis. They will inspect your appliances every time and catch any problems before they become significant. This maintenance service will save you time and money. Why choose us to do Sub-Zero appliance repair for you? We are the most skilled and knowledgeable company out there. We know how to deal specifically with Sub-Zero brand appliances and have certifications to prove it. Our techs are very detail oriented and are up to date on all the Sub-Zero technology. Whether you have an older Sub-Zero model or a brand new one, we will be able to order parts for you and expertly install them. Plus, our team is friendly and respectful and will not waste a minute of your time. In fact, we try to make every appliance repair appointment as convenient and as fast as possible. You can be sure that your Sub Zero appliance is in good hands! For Sub-Zero appliance repair, please call us at 925-265-7782 in East Bay or 628-214-0064 in Marin County. Or you can fill out our short contact form. We would love to talk to you and answer all of your questions. Besides Sub-Zero appliance repair are also certified to repair Asko, Bertazonni, Bosch, Dacor, DCS, Electrolux, Fisher&Paykel, Frigidaire, GE, Jenn-Air, KitchenAid, La Cornue, LG, Liebherr, Marvel, Miele, Perlick, Samsung, Siemens, Thermador, Traulsen, True, Viking, Whirlpool, Wolf. Sub-Zero builds innovative food preservation systems. Our company specializes in all Sub-Zero appliance repair, maintenance, and installation. We repair all models of Sub-Zero from built-in and integrated refrigerators to undercounter and outdoor refrigerators technicians coolers.